This is the story of an American family, as told through the eyes of Rosemary, the eldest daughter of the Cookes. It is the story of an everyday family, at one level, and an unusual one at another. It is a difficult book to review without betraying the big reveal – other reviews do that, but this one will endeavour not to. It’s not that it is a shock when it happens – the way that Fowler lays out the narrative, you know it’s coming, and when it does, Rosemary’s story makes more sense, adding a layer of ‘ah ha’, and poignancy, and yet another hook. 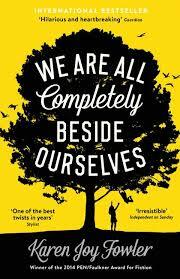 We are all completely beside ourselves is a first person narrative, a device that works superbly well. Rosemary talks directly to the reader, narrating, explaining, justifying – even avoiding. Rosemary, as a college student, is withdrawn – vulnerable and angry. As a child, she tells us, she was talkative, hoovering language and constantly chattering. Here is the first hook – what is it that has made her withdraw in to herself? Rosemary’s father told her as a child to ‘skip the beginning, start at the middle’, and this is where she begins her story. Rosemary is difficult to get along with. I found myself niggled with her, impatient with her, and yet I kept reading, all credit to Karen Joy Fowler. That said, Fowler’s choice of structure had little impact on me as a reader – the fact that it is in six parts made little difference. Nor did the choice of quotes from Franz Kafka, which also only gave value in retrospect. They were interesting contexts, but did not add to my enjoyment or appreciation (until after) – perhaps it would have been more a part of the reading experience had I read it as a physical book, and not with the inflexibility of the Kindle. In fact, the book really sits in three parts for me – the middle, the beginning (after the big reveal) and the consequences. The American family, the Cookes, are the central point of examination of the book, and you land in a place where the family is largely estranged. Two isolated parents, from Rosemary and each other, a sister who disappeared and a brother who deserted the family. The tragedy of the disappearance lies at the heart of the matter, revealing the intensity at which parents and siblings love each other and damage each other. It is a dark story, both intriguing and unsettling, but it is peppered with humour, mostly at the expense of Rosemary, as she conjures memories from her childhood. Alongside the theme of family, of loss, of betrayal is a whole ethical dilemma that you find yourself in. It makes for a bumpy ride. We are all completely beside ourselves is a beautifully written book; the language is at times delicious – rich and indulgent – but it is not an easy read. It is the discomfort of being with Rosemary, a character that I found it difficult to be around until much later in the book. I still cannot decide whether I liked the book, or not. As the story closes, you are still not sure whether Rosemary was a good witness of her past or not, and this is beguiling. Would I recommend it? Yes, because comfy is for shoes, and not necessarily for life. It is thought provoking and ultimately a very well written book, even though you are left with things unresolved – in you, if not the story.